In celebration of Yep Roc 15, we have teamed up with the Carolina Brewery for a signature beer that has been dubbed the Roctoberfest Lager. The delicious brew will be served at all official Yep Roc 15 events and can also be ordered this month at the Cat’s Cradle, Local 506, Aloft Chapel Hill – XYZ Lounge, The Station, Milltown, Carolina Brewery, The Arts Center , Tyler’s Restaurant & Tap Room – Carrboro, The Franklin Hotel, West End Wine Bar and the West End Wine Bar. Click the video below to watch a special video about the official beer of Yep Roc 15. What could be better to sip a Roctoberfest Lager out of than the official pint glass? 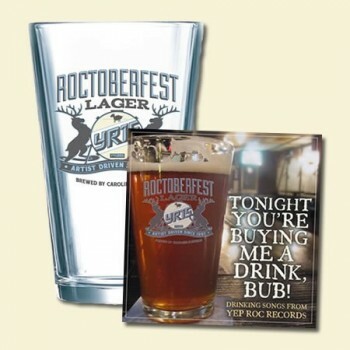 We are excited to annouce that Yep Roc and the Carolina Brewery have made a limited-edition Roctoberfest Lager Pint Glass that is available now at the YR15 Online Store. But you’re going to need some drinking music to go along with that pint, so let us introduce Tonight You’re Buying Me a Drink, Bub! – Drinking Songs from Yep Roc Records. The 14-song digital sampler includes pub-approved tunes from Fountains of Wayne, The Minus 5, Southern Culture on the Skids and more! Full track listing HERE. For a limited time only, you can get the Roctoberfest Lager Pint Glass and Tonight You’re Buying Me a Drink, Bub! digital samler bundled together for only $9.99. Watch the all-new “Llavo Un Tigre En Mi Guitar” music video from Los Fleshtones – QUATRO x QUATRO vinyl EP out now.